BikeCAD Pro Version 7.1 is now ready. Here’s a video describing some of the new features. 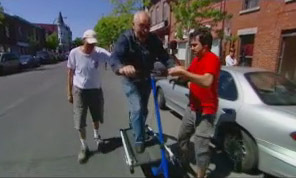 The Treadmill Bike recently appeared on the French language television show: Le banc d’essai du peuple which, in English, they refer to as The People’s Gizmos. Due to copyright issues, I can’t share the video here. 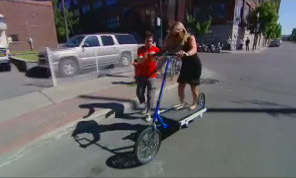 However, here are a few screen captures of the Treadmill Bike taking to the streets of Montreal. 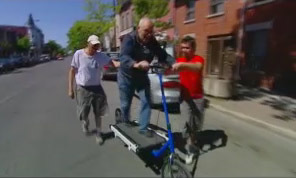 This man might have been old, but he sure came alive on the Treadmill Bike. 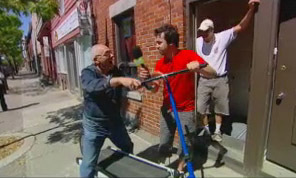 Meanwhile, this younger chap nearly ran away from the show’s host. 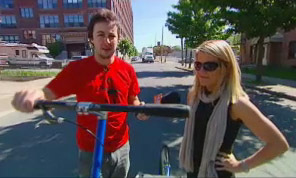 Most people didn’t know what to make of the Treadmill Bike. When this FedEx employee was asked to guess the price, he wildly underbid at $300. Alas, it must take more than one test ride to appreciate the $2500 value of this product. You are currently browsing the Bicycle Forest Blog weblog archives for March, 2011.